Over the course of a thirty-year conversation unfolding in train stations and travelers’ stops across England and Europe, W.G. Sebald’s unnamed narrator and Jacques Austerlitz discuss Austerlitz’s ongoing efforts to understand who he is. An orphan who came to England alone in the summer of 1939 and was raised by a Welsh Methodist minister and his wife as their own, Austerlitz grew up with no conscious memory of where he came from. W.G. 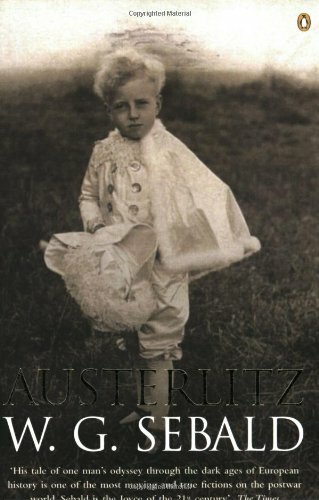 Sebald embodies in Austerlitz the universal human search for identity, the struggle to impose coherence on memory, a struggle complicated by the mind’s defenses against trauma. Along the way, this novel of many riches dwells magically on a variety of subjects–railway architecture, military fortifications; insets, plants, and animals; the constellations; works of art; the strange contents of the museum of a veterinary school; a small circus; and the three capital cities that loom over the book, London, Paris, and Prague–in the service of its astounding vision. I brought this book with me from Norway to Sweden and further on a trip to South Africa, Western Cape. I took a long time to read, but it was truly baffling and rewarding. The author Sebald has a distinctive voice of his own, originally that voice is (Catholic) German, and the intellect is roaming around like a creature of its own, flittering like a butterfly from one flower to the next, and when this book is finished you feel you have been a part of a special travel which was not by chance after all, but meant to be. I left the book in the hands of my new friend Allison in Rooiels, South Africa. I have more book by Sebald in my Bookshelf and will pick them up and read them one after one. Sadly he died quite you, on a motorway, in a front-to-front collison between cars, an end that is strangely similar to the fate of some of his characters.